The 2005 update to the National Electrical Code (NEC) includes two changes that affect the manufacture and installation of metal halide luminaires. Both changes address methods for reducing risk when metal halide lamps are used. The purpose of these changes is to reduce the risk of possible injury or property damage. Metal halide lamps can sometimes explode, shooting hot glass out of the luminaire. In an open luminaire - one that does not have a lens - this can result in a fire, personal injury, or property damage. Although violent failure is a rare occurrence (about three incidents per year), the NEC has included these changes to help reduce these hazards. In sports facilities, particularly in schools, athletic activity can break the outer jacket of a metal halide lamp used in any luminaire. When this happens, the arc tube can continue to operate with a damaged or missing outer jacket. If this condition occurs in an open luminaire, it can lead to UV overexposure, including sunburn and a burning sensation in the eyes. The NEC change requires complete lamp enclosure in these facilities, which will not only provide mechanical protection to reduce the possibility of damage to the outer lamp jacket, but also prevent the escape of harmful UV radiation and broken glass.  Use a special, exclusionary lampholder (socket) that will only accept an ANSI Type-O metal halide lamp. ANSI currently classifies metal halide lamps with three possible ratings: Types - O, S, and E. Type-O lamps include a shroud around the arc tube, which helps prevent damage to the outer bulb in the event of an arc tube rupture. In the ANSI C78.389 test, arc tubes are forcibly ruptured to test the integrity of the bulb and to determine if the design can be containment-rated. In order to receive the "O" rating, the outer bulb cannot be cracked or broken in such a way as to eject particles of glass when the arc tube is ruptured. Type-S lamps do not include internal protection against failure, but previously had been permitted for use in open luminaires when operated and installed in strict adherence to manufacturers and NEMA guidelines (see NEMA white paper, LSD 25). Type-E lamps are rated only for use in enclosed luminaires. By specifying that only ANSI Type-O lamps are permitted in open luminaires for NEC-compliant installations, the NFPA attempts to further reduce personal and property damage from metal halide lamp failure. Types lamps will not be permitted in open luminaires, and the specification that open luminaires are manufactured with lampholders that only accept Type-O lamps will help prevent accidental use of Types or Type-E lamps during normal maintenance. Lamp manufacturers that offer Type-O lamps, such as Venture Lighting, are already equipped to test lamps and currently perform the forced rupture tests and maintain the manufacturing processes necessary to ensure suitable performance in the field. Because of lamp size and shape restrictions, PAR lamps (parabolic aluminized reflector lamps) cannot be used with exclusionary lampholders. However, if they pass the ANSI containment test, they can receive the O rating. Existing installations that use open luminaires and Types lamps will continue to exist, even in municipalities that adopt the 2005 NEC. Venture Lighting strongly recommends that these lamps be replaced only with Type-O lamps which directly retrofit all existing lampholders. To avoid accidentally installing Types lamps, it is recommended that existing mogul lampholders (type E39) be replaced as soon as possible with exclusionary lampholders (type EX39). It is expected over time that the mix of metal halide lamps available will naturally shift to reflect the requirements of the 2005 NEC and that there will be an associated shift to luminaires that are either enclosed or that only accept Type-O lamps. The NEC change regarding open luminaires is the new section 410.4(E) that states, "Luminaires (fixtures) subject to physical damage, using a mercury vapor or metal halide lamp, installed in playing and spectator seating areas of indoor sports, mixed-use, or all-purpose facilities shall be of the type that protects the lamp with a glass or plastic lens. Such luminaires (fixtures) shall be permitted to have an additional guard." To address this requirement, new installations or remodels must use enclosed luminaires in facilities where there is a possibility of objects striking the luminaire. How is Venture Lighting addressing the new NEC requirements? Venture Lighting fully supports the NEC changes. These changes simplify the metal halide systems options available and also reduce the potential risks associated with failure to properly follow the warnings and instructions for systems that specify open luminaires with Types lamps. All MP and MPI lamps produced by Venture Lighting meet the requirements to be rated Type-O, and can be used with confidence to meet the new requirements of the NEC. Venture Lighting provides the industry's widest selection of lamps that meet or exceed ANSI C78.389-2004 testing requirements for a Type-O rating.  "Recommendations for the Care and Maintenance of High Intensity Metal Halide and Mercury Lighting in Schools."  LSD 31-2004, "A Lighting Systems Division Information Bulletin: Changes to the 2005 NEC Will Impact Future Metal Halide Systems Options."  LSD 25- 2004, "Best Practices for Metal Halide Lighting Systems, Plus Questions and Answers about Lamp Ruptures in Metal Halide Lighting Systems."  ANSI C78.380, Annex B, American National Standard for Electric Lamps-High Intensity Discharge Lamps, Methods of Designation.  ANSI C78.387, American National Standard for Electric Lamps-Metal Halide Lamps, Methods of Measuring Characteristics. Underwriters Laboratories. See "UL 1572, High Intensity Discharge Lighting Fixtures," Underwriters Laboratories Inc., Northbrook, IL. CSA C22.2 No. 9.0, Luminaires, CSA International, Toronto, Canada. UL 1598, Luminaires, Underwriters Laboratories Inc., Northbrook, IL. CSA C22.2 No. 250.0-00, Luminaires, CSA International, Toronto, Canada. Note that these last two standards are the Bi-national Luminaire Safety Standard. The NEC is administered by the National Fire Protection Association (NFPA) and is revised every three years. The 2005 NEC has been released for publication and is currently available from the NFPA at www.nfpa.org. 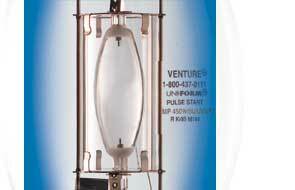 For over 15 years, Venture has been leading the way by producing metal halide lamps that contain protective shrouds. In the event of an arc tube rupture, the shroud helps contain hot particles within the lamp. One more reason Venture is building lighting systems with safety in mind, your safety.